If you read a blog post of mine back in the summer then you'll know that I have a love-hate relationship with midi length anything. At 5 foot 7, I find even on me midi length can be a little unflattering, yet I love how feminine the style can look. 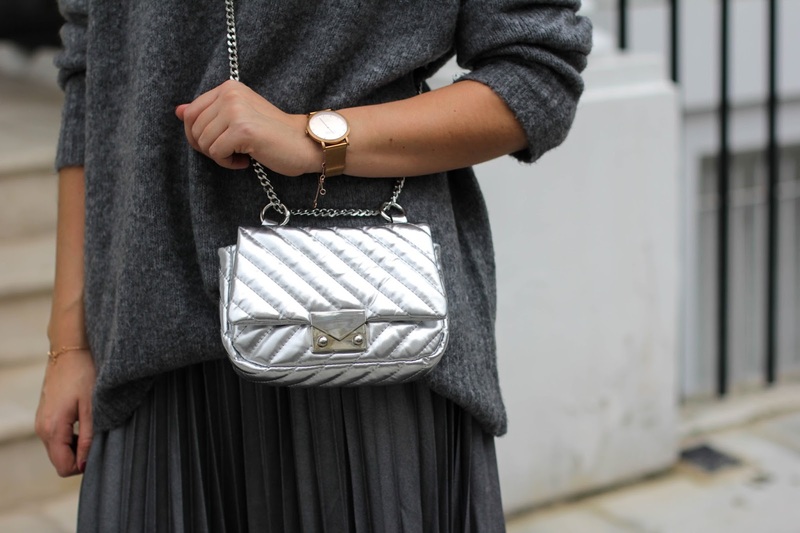 With that said, this silver plissé midi skirt has become a firm favourite of mine in recent weeks. 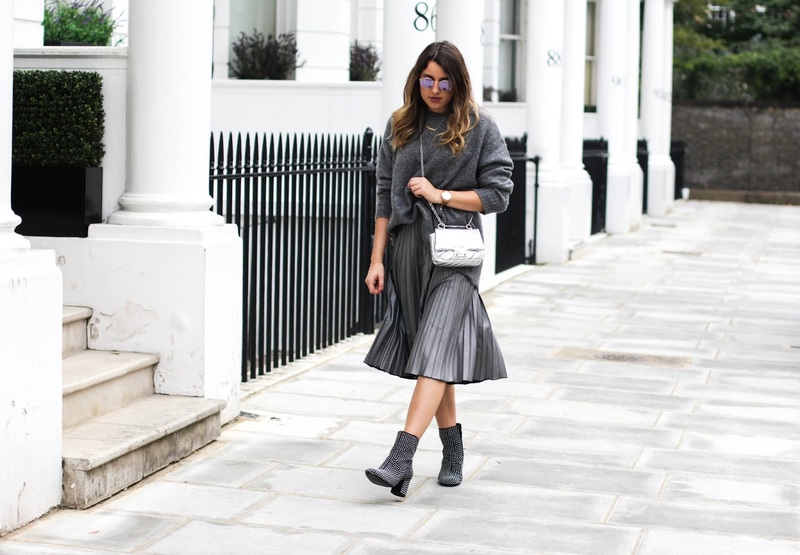 Worn here with an oversized cosy jumper, it's something I have incorporated lots into my everyday style. You can see another example of how I've worn this pleated midi skirt for an everyday casual look here. Don't get me wrong, I do love an all grey outfit but I felt that this look needed a little something to give it that wow factor. So the inner magpie within me surfaced and I went for metallics and studs because why the hell not?! With bonfire night out of the way, it's now time to mentally shift to all things festive which of course involves metallics, sparkle and lots of exaggerated textures. I don't know if this goes without saying, but the moment I put on a pleated midi skirt I find myself twirling around at random points throughout the day. A little embarrassing I know but I just can't seem to help myself. What can I say, it's just the effect that a pleated midi skirt has on me. With the exception of a dress, I feel there is no other style of clothing that makes you feel as girly as a pleated midi skirt does. As it's currently freezing in London, quite frankly you can't leave the house without a coat. In the past, I have often found pairing a coat and midi skirt somewhat of a challenge. Nothing ever seemed to look right. I usually would reach for my leather jacket but it's far too cold for that. 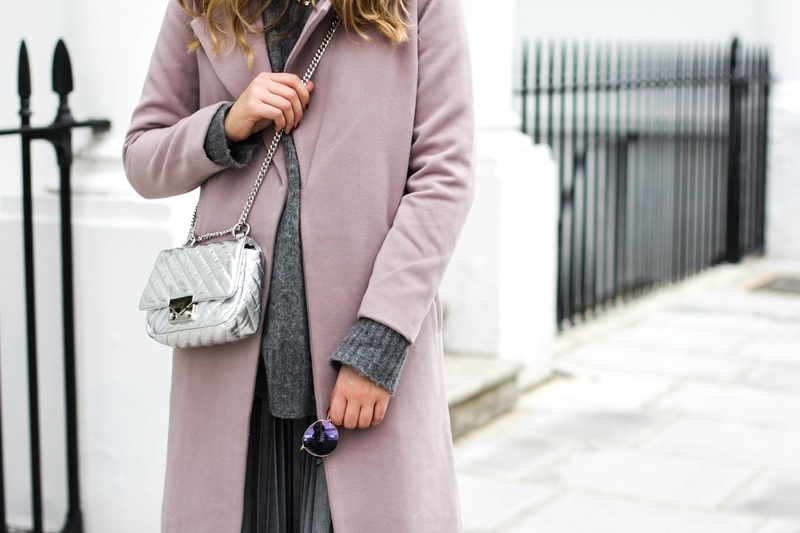 This mauve longline coat is a recent addition to my winter wardrobe and I'm loving the way it compliments this grey outfit. At first I thought it may have been an impractical purchase, partly because of the colour but it really does go with a lot I currently have in my wardrobe. I mean can we just take a few seconds to appreciate how amazing these studded boots are. 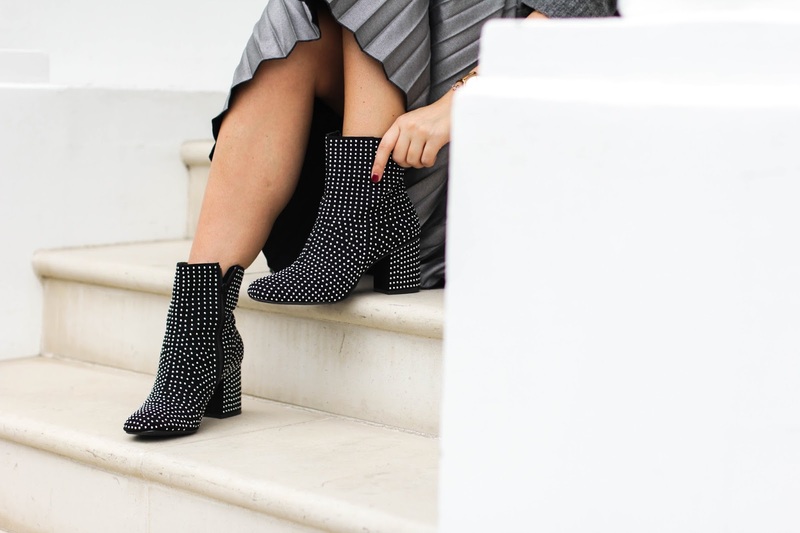 You could probably wear a bin liner with these studded beauties and still look fab. There's no better feeling than knowing you've got a kick arse accessory that's totally going to own your outfit. After all, Marilyn Monroe once said "give a girl the right shoes, and she can conquer the world". Paired here with this pleated midi skirt, these boots would look just as good with your favourite pair of black skinny jeans. They've definitely become a firm favourite of mine and with just the right heel height they are the perfect everyday boot. 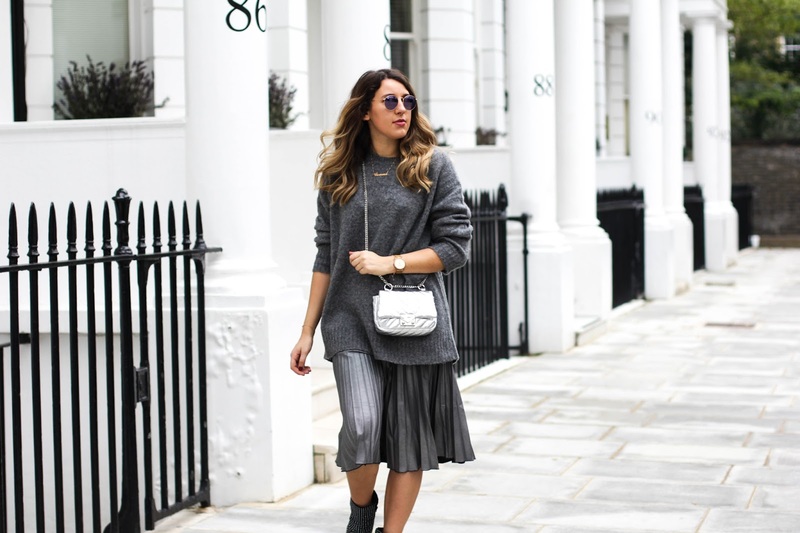 Whether you're looking for ways to wear a pleated midi skirt this winter or perhaps want a piece for the party season opt for metallics because they are everywhere this season. There are also a number of amazing velvet options which look just as good and will have you feeling festive in no time. Such a great post! I love how you styled everything. This is a stunning look! Niceley written :) Lovely post! Omgosh boots are 😍 I love how you made this look A/W. I love this look, the boots are gorgeous! Im in love with your look. Beautiful. Love this look so much! The grey and metallic elements compliment each other so nicely. Not going to lie, very tempted to just copy this entire outfit haha you look fab girl!